The 2019-20 Free Application for Federal Student Aid (FAFSA) form is available for students and parents to complete through the myStudentAid mobile app. This tool will allow you to easily complete your FAFSA on your cell phone. Use the IRS Data Retrieval Tool (IRS DRT) to electronically transfer federal tax return information into a FAFSA form. Please note: for the 2019-2020 school year, you will need 2017 tax returns. In addition, parents can use the app to transfer data from one child’s FAFSA form to a new FAFSA form for another one of their children. 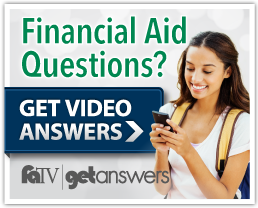 Did you know that you might be eligible for financial aid to help pay for college? Start the process by filling out the Free Application for Federal Student Aid (FAFSA®). The FAFSA will be available starting October 1, 2018 for students who plan to attend college for the 2019-2020 academic year which begins in September 2019. The FAFSA asks for information, such as your name and Social Security number, as well as information about your financial situation. After you submit the FAFSA, watch for offers of financial aid from colleges you applied to and have listed on the FAFSA. Make sure you compare the aid offers to see which school offers the best combination of net cost and “fit” for your academic needs. Get ready for the FAFSA by creating an FSA ID, a username and password combination that you’ll use to sign the FAFSA and access certain websites related to your federal student aid.